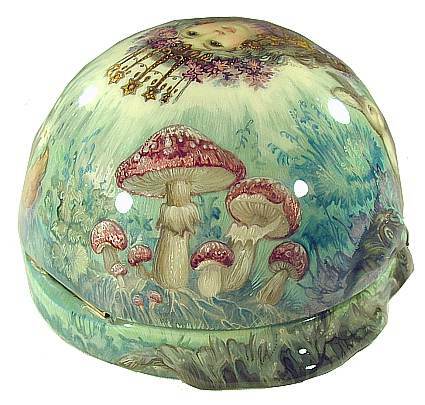 The cheerful face of a crowned faerie from the forest rises up from the ground in this beauiful semi-spherical box by Fedoskino artist Mochalova. A small group of animals surround her along the sides, including a bird in flight, an alert rabbit, and two chipmunks, playing among the flowers. A patch of mushrooms, with gold and purple caps, has also been drawn in one section. Crafted in relief near the bottom is a sculpted network of tree roots. This gives the work a very unique feel, and the box beckons to be held and examined in one's hands. 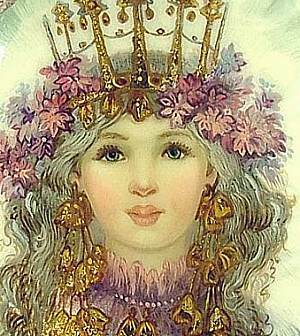 The crown of this fey is accentuated with radiant gold, while the rest of the colors are soft and soothing. The bottom has an abstract greenish pattern to it. The inside is red. It is hinged near the bottom and is signed with the name of the artist (Mochalova) and title. The artist is one of Fedoskino's rising stars and continues to create superior pieces. 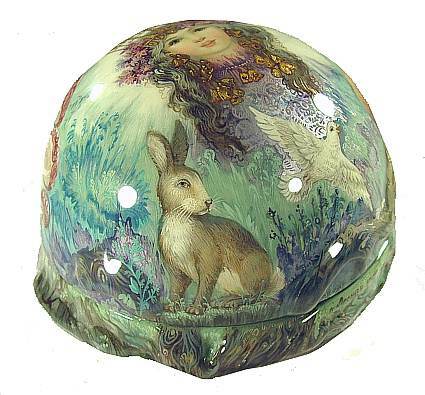 She has other works on our site and in "Russian Lacquer Miniatures".